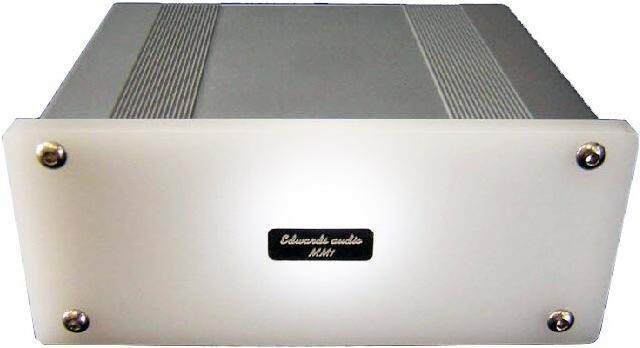 Edwards Audio MM1 MkII is the latest version of this excellent phono stage, offering inputs for moving magnet (MM) or high output moving coil (MC) cartridges. Performance is far from basic as its beauty is in its simplicity, one of the finest phono stages we've heard in its class. Unique at the price, its fully RoHs compliant gold plated custom made double sided PCBs, natural anodised extruded aluminium case and high quality internal parts, as used for all Edwards Audio products. It also features high grade 1% thin metal film melf resistors plus Panasonic FM series PSU caps and Vishay polyester/polypropylene film capacitors throughout. The RIAA. Equilisation accuracy is within 0.25dB across the audio band and signal to noise is very low -81dB A-weighted. In short, its simply rather stunning for an entry level model! Attention to detail also extends to the custom made plug top power supply, the PSU1 which is unique at this price level for its use of a split rail design using + and - DC power outputs for maximum rejection of RF noise, maximum dynamic range and overload margin. It also uses a gold plated custom made PCB with high quality diodes and snubber caps. This is no normal ‘off the shelf’ PSU as used by the competition. Traditional Talk styling and performance requirements have not been overlooked either with illuminated metal etched badges and opal white front and rear panels as standard. This is the best built and most aesthetic phono stage in it’s class but it doesn't stop there it also delivers in the sound department as well, with expansive and detailed sound staging, normally associated with more expensive phono stages. It is also upgradable through the use of a dedicated PSU1 Power supply.